Friends, I can hardly believe the words in front of my face: Braxton has been in SCHOOL for TWO MONTHS! 50 days…approximately. (Not that I’m counting or anything). We have had an incredibly amazing start to our special education journey. It’s no secret that I was VERY worried about putting Braxton in to school and scared that he would regress because he was no longer in a full time program. I’m happy to report that I was VERY wrong. The journey is different for everyone, but so far, ours has been a success. (Don’t worry, I promise not to do all fifty individually, it’s just logical to start at the beginning). I was an absolute MESS the first day of school. We attended “Meet the Teacher” night the week before and I felt some of the tension release when I finally met Braxton’s teacher. She seemed very nice and caring and despite the million questions I had, she never once rushed me away or made me feel like my questions were unimportant. She also mentioned that she had spent some time reading our blog and getting to know Braxton. Imagine my surprise! I can’t even get a doctor to read Braxton’s chart before they walk in the room for a scheduled appointment. But that’s another story for another time. 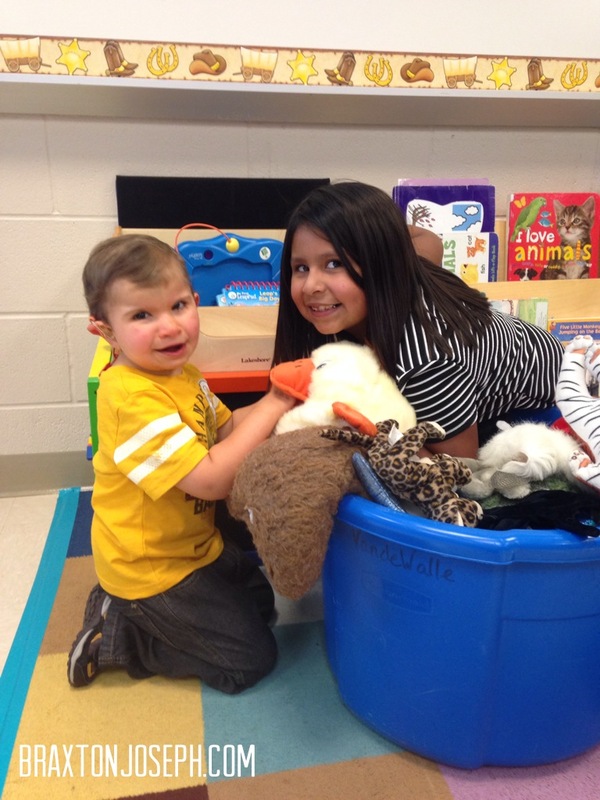 Braxton explored the classroom without hesitation and we dropped off his school supplies. The teacher asked me to come in before school started to talk about Braxton’s feeding routine and wanted to make sure they were prepared. When I arrived, I learned that the Speech Therapist had given them a crash course on Blenderized Diet and how to puree food, so the teacher’s thought THEY would have to blend his food for him! I’m sure there was a collective sigh of relief when I let them know I would provide Braxton’s food already prepared daily. They were able to watch Braxton eat and I gave them some tips and talked about some of the things we watch for when he’s eating. I was a little worried that a new place and new people might make Braxton a little anxious and make him not want to eat the first day, so I asked if I could at least stay that first day through lunch to help mitigate any issues. Despite having attended the back-to-school night and meeting the teacher a few days later, I was still quite scared for his first day. I don’t think there is anything quite heartbreaking and exciting for a parent as sending a child to school for the first time. I dressed Braxton in some new “big boy” clothes, prepared his lunch, and put everything in his cute little backpack. I felt the tears well up. When we got to school, I walked Braxton to class and got to sit through their welcome routine. To my surprise, Braxton sat still on the carpet with his class and paid attention to his teacher as they sang and welcomed everyone to school. When I sat in on the class last year, I remember thinking “yea, there is NO way Braxton is going to sit for all of this.” Well, he sure showed me! (As he often does). The classroom aide was wonderful with Braxton and his other classmate who is not very mobile. She helped them clap and move and stand, and it was just awesome to see. We went to lunch, and Braxton decided that he did not want to walk so we had to carry him. At this point, we discussed the use of a wagon at school for long distances. I was pretty adamant that I did not want Braxton using a walker, but I was okay with a wagon as long as they did try to walk with him first. When we got to the cafeteria, I let the teacher feed him so that I could see if he would have any anxiety about the noise in the cafeteria and a new person feeding him. Braxton had gotten used to different people feeding him in daycare, BUT he would get upset if someone started feeding him and then a new person came in mid-feeding. I was also worried all the new people and sounds would keep him from wanting to eat. Again, he made mom look a liar! He ate like a champ. The school speech therapist was also present to evaluate his eating and make sure they took all the necessary precautions. Everyone was on board and pleased with Braxton’s eating skills. It’s amazing how far he’s come. If you spent any time with him now, you would NEVER guess that there was ever a time when I couldn’t even get the spoon near his mouth. I left the school confident that Braxton was in good hands, but I did cry on the way home. The first few days were a little bit tough on me, but Braxton did wonderfully. The teachers reported that he was doing well for them in class and adjusting to the routine quite nicely. He was also eating quite well for them at lunch. Braxton relied on the wagon quite a bit in the beginning, but the teachers assured me they were walking with him in class a little more each day. I was confident that Braxton would adjust to the schedule and slowly be more tolerant of walking a little bit further every day. When we met for our first ARD in June, I asked that we have a new one when school started so that I could meet the therapists who would be working with him and also provide updates because I knew he would grow so much over the summer. We also had to adjust his IEP to allow for the school to feed him based on the recommendations of his doctor and a Modified Barium Swallow Study that told them it was safe for him to eat by mouth and bypass his g-tube. After the first week, I contacted his teacher to go ahead and schedule the ARD. I went next door with the speech therapist and AT rep to discuss communication options. Braxton’s teacher popped in as well and was very interested in learning more about our plans for Braxton. I was beyond thrilled when I learned that our district would provide Braxton with ANY communication device/program necessary until he graduated from the district! I was flabbergasted. I’ve talked to SO many parents who have fought tooth and nail to get the district on board with bringing a device FROM HOME, that it was nice to hear them say they would provide what he needed and we would be able to take it home daily and over the school breaks. We talked about different iPad programs and options and the ST and AT told me they would begin evaluations with Braxton’s the next week. Braxton’s teacher was also quite excited to start working with a device with Braxton, so again, it was such a huge relief to have everyone on board and not have to put up a fight for anything at all. After the ARD, things seemed to continue going well. 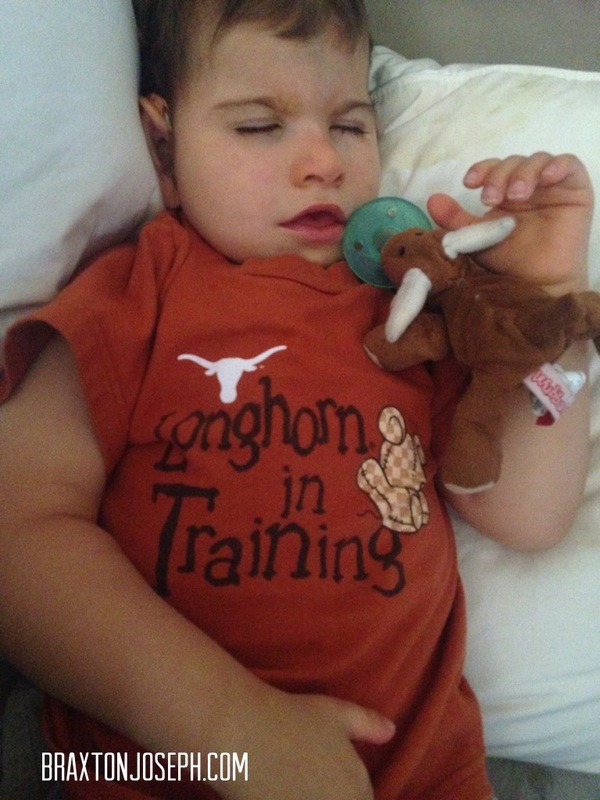 As Braxton adjusted to his new schedule, he was coming home quite exhausted! Over the summer, he didn’t really nap a whole lot, so it seemed as though he was growing out of the need for a daily nap. He slept for an hour at most each day. Once school started, he had therapy every morning and then school from 11 am to 2pm. When he got home at 2 pm, he fell asleep almost immediately and slept 2-3 hours every day!! He’s adjusted quite well now and doesn’t fall asleep until bedtime. Sometimes, we will put him down around 4 pm because he starts to get a little cranky. Within a couple of weeks, I started to notice Braxton making some changes at home. He was standing a lot more and walking between us and cruising all over the house. We put a crayon in Braxton’s hand and he colored for the first time ever! The teachers continued to tell us that Braxton was making progress and doing well in school. They told me that he was starting to walk more for them as well once he got used to the schedule. Our school is really great about having family events and getting everyone involved, so I really saw his progress when we attended these events. He walked from the parking lot in to the school and around the school with no problem, colored, played, and smiled the entire time. His teachers fell in love with him pretty quickly and vice versa. There have been mornings where Braxton is very cranky and won’t cooperate with me at all, but the second we pull in to the school parking lot I hear him laughing and babbling in the back seat. As I get him out of the car, his little hands go up in the air and his whole body begins to shake as a huge smile comes across his face. I can tell that he is excited. He walks with me over to his teachers and his face just lights up. He walks to his aide and gives her a big hug every single morning. And his teachers are always happy to see the kiddos. They greet everyone and acknowledge the kids and always seem to genuinely be in a good mood. I know that Braxton is in really good hands and his teachers have a sincere vested interest in the kids’ success. 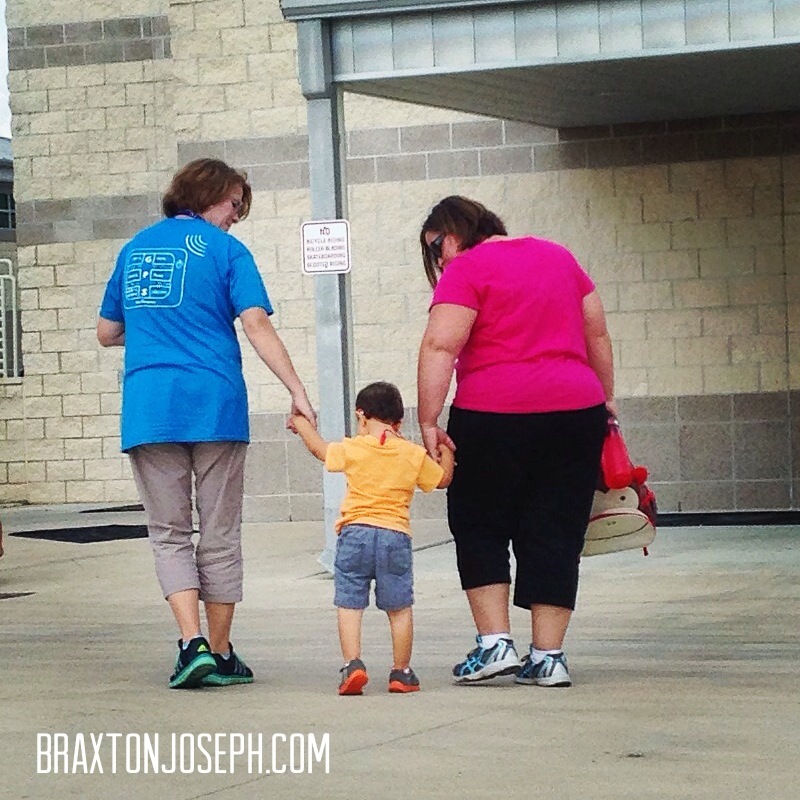 Braxton walking with his teacher and classroom aide. 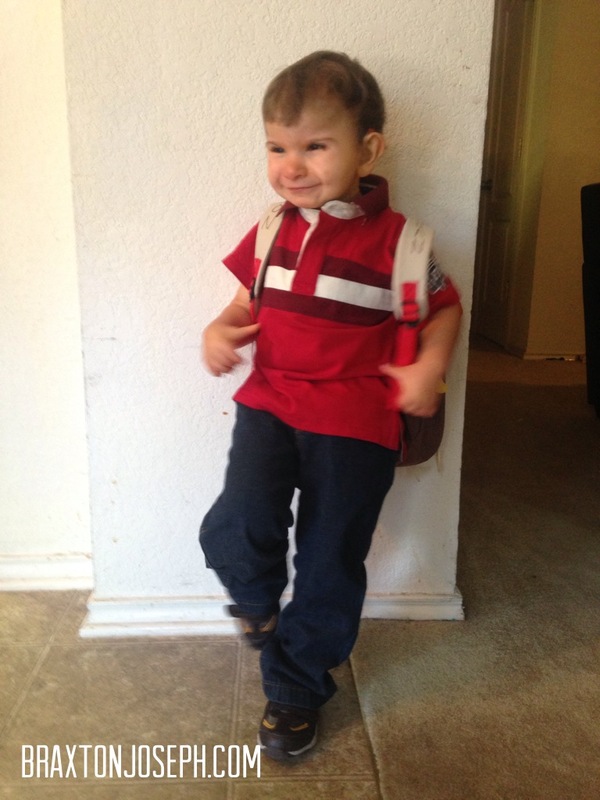 Now, two months in to school Braxton is transforming right before our eyes. He is closer than ever before to walking independently. He will now walk by himself at home and in the classroom. He walks from the living room over to the playroom, or just from his feeding chair over to a nearby toy. He’s even stood up in the middle of the floor and kept walking completely on his own. It’s mind-boggling to look up and just see Braxton walking right by me to get to a toy in the other room. It’s been a long hard road, but it’s paying off BIG! Braxton’s gross motor skills are taking off. 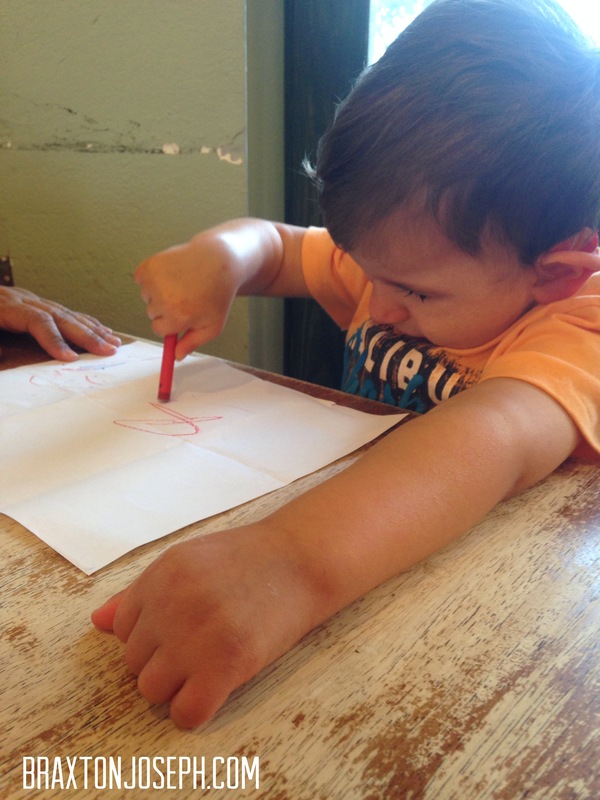 His fine motor still needs a lot of work, but we’re seeing progress. He is starting to babble and vocalize much more as well, which is certainly promising for us. I truly feel that we will have a verbal breakthrough soon and Braxton will have some speech. I know that using his communication device is going to help his language develop as well, so I’m really excited to see how he does. I will write more on our AAC journey as well. (Soon! I promise!!) Lots of exciting things happening there! Overall, I have been quite pleased with our start to school. It’s still hard to believe that our little guy is actually in school, but it has been wonderful for everyone. He attends Aileen’s elementary school, and she is elated that he goes to the same school as she does. She is SO proud of him and having him in school has even helped her! She worked out an incentive with her teacher and Braxton’s teacher that allows her to go in to his class and read to them every so often. She loves being able to go in to class with him and I’m sure Braxton likes seeing her as well. I love that everyone is working together for Braxton and am so glad to see him flourishing. My sweet boy is growing every single day and we are full of so much hope for the future. I’m so happy to read that he’s doing so well! I’ve been volunteering with kids with developmental disabilities, and now have a profound and immense respect for their parents and educators! God bless you.